FFA - Dr. Joel C. Hunter, senior pastor of 15,000 evangelical Christians at Northland Church, partners with Atif Fareed, Former CAIR Florida Chair to oppose anti-Sharia bill in Florida Legislature. delivered Hunter's message to the senate. Mega church senior pastor of 15,000 evangelical Christians partners with Islamist to oppose anti-Sharia bill in Florida Legislature. Perhaps you can educate Dr. Hunter with facts regarding Islam, Jihad, Islamists, CAIR, Sharia and Taqiyya. 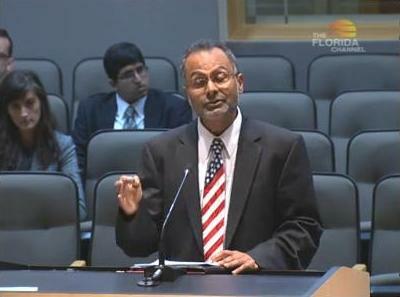 Dr. Joel C. Hunter, senior pastor of the Northland Church in Longwood, Florida, asked Atif Fareed, former Chairman of CAIR Florida, to read Hunter's statement opposing SB 58 Application of Foreign Laws in Certain Cases to the Florida Senate Committee on Governmental Oversight and Accountability on March 21, 2013. “To my state senators: As a pastor of one of the largest churches in Florida I believe Senate Bill 58 will do more harm than good if enacted. Its effect will be to increase bias rather than protection. It seems to me to be a cure without a disease. Existing law and judicial precedent have proved sufficient to deal with any concerns addressed by this proposed law. Having confidence in both our constitution and the character of our judicial process I agree with the America Bar Association, the Anti-Defamation League and the American Civil Liberties Union that this law and House Bill 351 will be detrimental rather than the good intended. As a conservative evangelical Christian it is unusual for me to side with the ACLU but I think objecting to unnecessary law is a conservative principle as well as a libertarian one. In deed not making laws unless they are absolutely necessary is at the core of our character as a country. Thank you for considering my views. Dr. Joel C. Hunter, Senior Pastor Northland Church distributed. To see the video recording of Atif Fareed’s presentation to the Senate Committee click here and advance the video to the 68 minute mark. A gentleman just presented a statement allegedly authored by Dr. Joel Hunter condemning SB 58 Application of Foreign Law in Certain Cases. Did Dr. Joel Hunter write and authorize this statement? Chairman of the American Muslim Community Centers, Inc.
Former Chairman of CAIR Florida, Inc. The scriptures proclaim “The God of Abraham, the God of Isaac, the God of Jacob…” Exodus 3:15 God also said to Moses, "Say to the Israelites, 'The LORD, the God of your fathers--the God of Abraham, the God of Isaac and the God of Jacob--has sent me to you.' "This is my name forever, the name you shall call me from generation to generation. Matthew 22:31-32 have you not read what God said to you, 32 ‘I am the God of Abraham, the God of Isaac, and the God of Jacob’ He is not the God of the dead but of the living.” Acts 3:13 The God of Abraham, Isaac and Jacob, the God of our fathers, has glorified his servant Jesus. The scriptures do not proclaim “the God of Abraham, the God of Ishmael, the God of Muhammad.” God help Americans to learn the truth. Sadly, Dr. Joel C. Hunter is helping the Hamas linked, Jihadi apologist, Council on American Islamic Relations (CAIR) to stop laws from being enacted that would prohibit courts from accepting Sharia law.